St. Nicholas originated as an agricultural community under the patronage of several different landowners that has grown around the Church and the historic Manorial estate and along an old Roman road that is now the A48. The village lies on the high ridge along which the former Roman road runs Cardiff to Cowbridge and beyond, with sweeping views to the north and south. Remains of a Roman camp have been found behind the primary school. The ancient name of the Parish was Llaneinydd, with the current name of St Nicholas likely to be Norman. The photograph is of Blacksmiths Row, looking towards Cardiff in 1908 - you can also see the Church Hall on the right. A very large cromlech, with a copestone 24 feet by 17, and a chamber about 14 feet long, 15 feet wide, and 6 feet high, is near the village; another, not so interesting, is close to Dyffryn House; and there are traces of other Druidical remains. The living is a rectory in the diocese of Llandaff. Value, £275. * Patron, J. B. Pryce, Esq. The church is ancient.—The sub-district contains also fifteen other parishes, and two extra-parochial tracts. Acres, 30, 865. Pop., 4, 705. Houses, 941. ​ST NICHOLAS is a parish and village 6 miles from Cardiff, situated on an eminence on the road from Cardiff to Cowbridge, distant 6 miles from the latter place, and about 5 miles distant from the Bristol Channel. In the parish are some Druidical remains, and it is said that Oliver Cromwell slept in the manor house. A. C. Bruce Prye, Esq. J.P. of Duffryn House, is lord of the manor. Petty sessions are held in the police station on the first Wednesday of every month, at which time the Highway Board also meet. The church of St. Nicholas is a neat edifice. The living is a rectory in the patronage of the above-named gentleman. There are also chapels for Calvinists and Baptists, and a National Schoool. Population in 1861, 354, and in 1871, 419. The village prospered as a farming community during this time, with the passing trade sustaining a number of inns. The Crown Inn, Prince's Arms, The Travellers Rest, and the Three Tuns were all clustered within the area of the church and manor. None exist now, though The Three Tuns is converted to residential use and the Prince's Arms is Trehill House. Ordnance Survey reveals that the basic footprint of the settlement underwent little alteration. 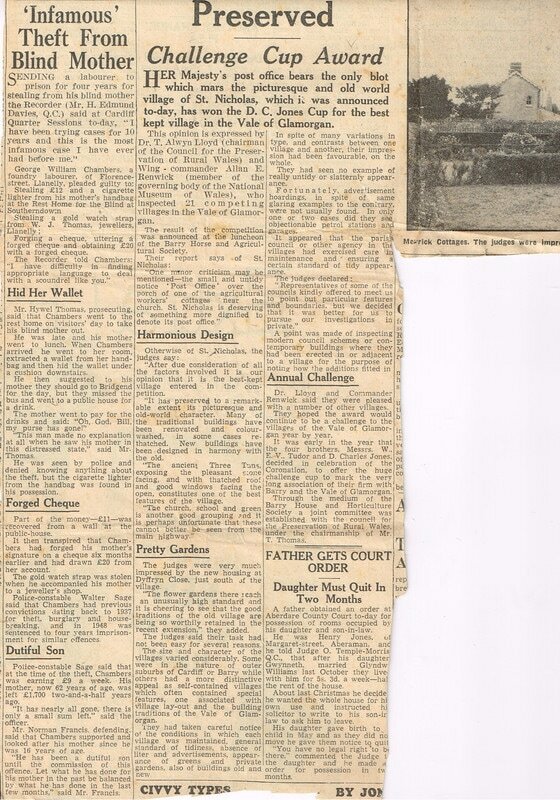 The infilling and expansion carried out from the mid-20th century was to be more extensive, beginning with the construction of 24 new homes at the newly created Dyffryn Close and Button Ride. Situated opposite the old quarry and reached via Duffryn Lane, the houses were erected by Cardiff Rural District Council during the late 1940s to provide the community with further rented accommodation. The development of state housing by the Cardiff Rural Districat Council during the fifties and sixties, sought to consolidate the large community that had developed. The housing is set principally to the south along Duffryn Lane. 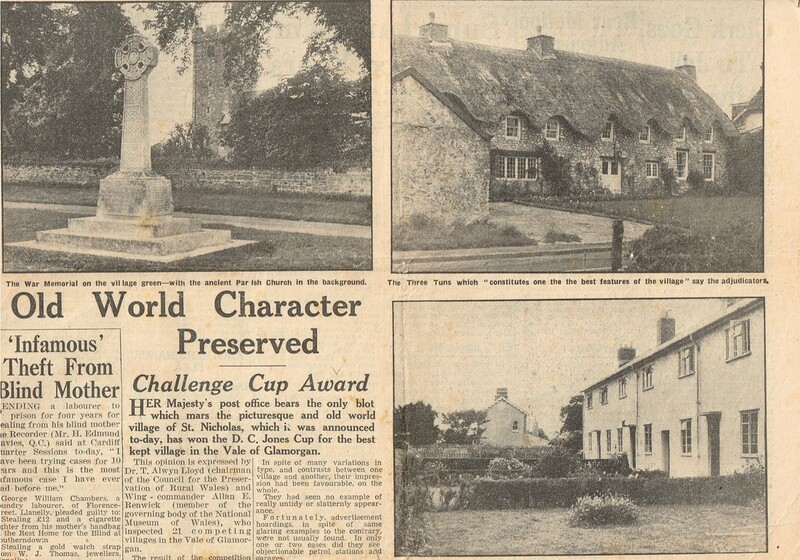 St. Nicholas won the first "Best Kept Village" competition in the Vale in 1954, and again in 1960. ​The last period of the villagers growth has been the most profound and is the result of the villages popularity as a commuter settlement. Large detached houses have developed within garden and orchard areas to the north of the church and along the A48. This has expanded the village and changed its character on the outer fringes. St. Nicholas has been home to a number of High Sheriff's. ​Field boundaries, walls and hedges lined the road (now the A48) and define the former farm estate boundaries. Since 1952, important trees have been protected by a Tree Preservation Order including historic groups within the Manor, Llaneinydd, The Court and along Duffryn Lane. Of significance too, are trees within the churchyard and around the school. An ancient yew stands to the rear of Blacksmith's Row, it is very early however a group of chestnut trees at the entrance to Ger-Y-Llan that framed the village green and war memorial no longer exist. ​Listed buildings are clustered around the Parish Church of St Nicholas and along the A48. These early buildings at the centre of the village are enclosed by high boundary walls which define the network of lanes running North into the farming land of the Cottrell and Coedarhydyglyn estates. The use of local materials such as limestone, slate and thatch for the buildings is important although many of the buildings have been built from rough rubble limestone and have been rendered and painted white. Some of the 20th century houses in the Conservation Area follow this example and are also rendered and painted white which does provide some cohesiveness despite their modern details. The 1948 houses in Dyffryn Close and Button Ride are notable for their white rendered elevations and ‘Tudorbethan’ details including timber framing and decorative quoins to the openings. Some of them retain their original Crittall steel windows, but most have been replaced using modern materials. The Church Hall and adjoining house are notable for their clay tiled roofs, attractive original joinery, limestone walls, and the white painted turret which provides an important focal point in views along the main road. Pitched roofs, which suit the Welsh slate covering, are usually seen on the older buildings although where they are thatched they are much steeper to provide the fall needed to prevent water ingress. The only thatched properties are Trehill Cottage, nos. 3, 4 and 5 Smith Row and the Three Tuns. A substantial barn facing School Lane is the only visible unaltered reminder of the many agricultural buildings which could once be found in the village. Roadside walls are built from the same grey limestone rubble blocks of varying sizes as many of the older buildings and are a prominent feature of the Conservation Area and help to maintain a historic character to the village centre.